What Is the Fuss about Management of Change? 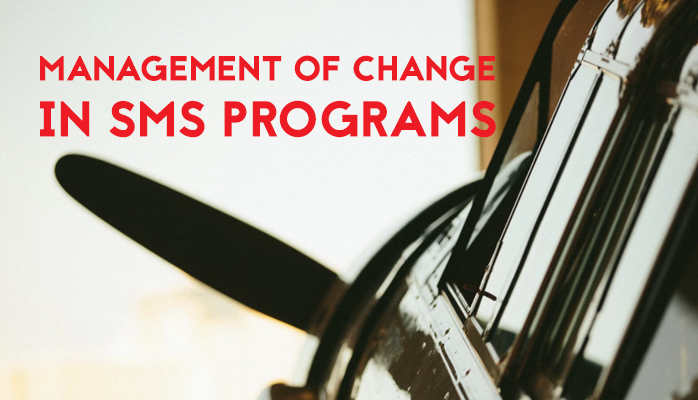 Management of change in aviation safety management systems (SMS) is essential for managing operational or organizational change. Safety teams are typically involved in the management of change (MOC) exercises. There is often confusion among new aviation safety managers when they are confronted with answering auditors' questions regarding MOC in their SMS. Best practices should always be reviewed when implementing your MOC workflow. This article will briefly describe MOC and some preferred best practices. Why Do We Need Procedures for Change Management? "A change management process should identify changes within the organization which may affect established processes, procedures, products, and services. Prior to implementing changes, a change management process should describe the arrangements to ensure safety performance. The result of this process is the reduction in the safety risks resulting from changes in the provision of products or services by the organization. Change management should consider the criticality of the system and activities, the stability of the system and operational environment and past performance of the system." Interfacing with safety counterparts of vendors and suppliers. There is a lot going on, and without documented AND practiced procedures, one can easily miss a step when managing risk resulting from the proposed organizational change. There is a key word here that needs some clarification: "procedures." Why Do We Have Procedures? We throw the word "procedures" around so casually that when we think of "procedures" or "processes" that we think of "what are procedures" and seldom why we have procedures. Let's get a quick definition task out of the way before we continue. That way when I throw out a term, we are on the same page. interfaces among these different elements. As you examine a system, you will define processes and procedures. If we take one step down, we can say that a system contains processes and processes have procedures. So it is a matter of depth or detail that we use to determine what is a process and what is a procedure. Processes may have one or more procedures. Conversely, procedures do not have processes. Procedures could be broken down into smaller tasks and subtasks, such as those found on checklists. I believe you get my point. When employees are trained to provide the company's services according to defined procedures, the company should be able to accomplish business related activities with minimal risk. When accidents or anomalies occur, the system design is reviewed to determine "what went wrong." As the root cause is identified, the system may require a design change. After change has been implemented, the system is monitored. When substandard performance is detected through reported safety concerns or audits, then risk is evaluated and when judged as unacceptable or not ALARP (as low as reasonably practical), then the system goes back to the design phase, which are the safety risk management (SRM) processes. The monitoring phase is the highly popular safety assurance (SA) component of an aviation SMS. In short, procedures are valuable to the company because they allow employees to engage in repeatable business processes with safe operating parameters. When procedures are not followed, management loses control over the system. the operating environment to change, introducing unacceptable risk to operations. interacting with identified hazards in previously uncontrolled circumstances. In short, risk controls maintain control. Risk controls assure management that procedures are being followed. What Triggers Management of Change Process? What causes safety teams to initiate the management of change process? The Civil Aviation Authority of Australia has produced the best documentation regarding management of change. Unfortunately, it isn't easily available anymore. I found this copy on ACT Vantages' site for Managing change in the aviation industry. These are some very good principles to consider when starting the MOC process. How to Manage the Change Management Process? Let's assume you have read the excellent documentation produced by CASA (Australia's CAA). How will you perform the change management process? From beginning to end, each change management request follows your checklist through a standard process based on an accepted template. This ensures consistency and thoroughness while also offering flexibility. Each step in the process may be optional in this established change management process, based on the change under scrutiny. Of course, the management team will also review existing risk controls to determine whether they are adequate. When risk remains unacceptable, additional risk controls will be introduced in the system design. Checklists ensure that changes are controlled and well-evaluated by incorporating crucial steps and approvals into the change management workflow to ensure that nothing is missed. Best practices should include tracking at each stage in the process. This can be done using version controlled document management or using aviation SMS databases with management of change tools. Aviation management of change software saves considerable time and energy documenting change and automatically creating an audit trail. Auditors love picking at management of change whenever performing aviation SMS audits. Having a templated process to manage change is the first step to satisfying this SMS requirement. Make sure you use it when performing your change management activities. Being able to document change management activities using software saves time and reduces risk to regulatory findings. Furthermore, when you have these tools integrated into your risk management software, you gain additional power and utility to track hazards and risk controls associated with your MOC project. A well designed, modern SMS database reduces risk and facilitates regulatory compliance.